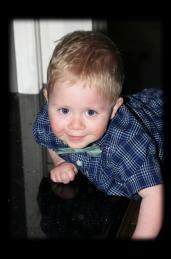 Conor was born a little fighter from the very start coming into this world 10 weeks early with Hydrocephalus. He spent 102 days in hospital between the Neo Natal unit in Limerick’s Maternity Hospital, Temple Street Children’s Hospital in Dublin & Limerick’s Mid Western Regional Hospital. It took a whole month before we knew if he was going to survive or not and he fought endless battles that no parent should have to see their child go through to finally get to come home. Conor’s development was delayed both physically & mentally but he managed to smile every step of the way and brought so much happiness to everyone he met, even when he was admitted back into hospital to have major surgery, he always had a smile for you. In his short two years, we as a family have done fundraisers for those hospitals to thank them for everything they have done for our brave son and this year was going to be no different. Unfortunately Conor was taken from us way too early at the start of this year and we are still absolutely devastated not to wake up to his beautiful smile every morning. We want to carry on saying thanks to those who helped us and to try help others in similar situations. This year we will be fundraising for the amazing charity – Clionas Foundation. This charity helped us financially when Conor was up in Dublin for 5 weeks for non medical expenses such as accommodation, food and day to day expenses for which we are extremely grateful. To start our fundraising this year we have set up this page for those who expressed an interest to donate to a charity of our choice instead of sending flowers to Conor’s funeral. We really want to keep Conor’s memory alive through fundraising and we would be so grateful if people could donate to this charity. Every donation counts no matter how big or small and will go towards helping other families who unfortunately have to go through what we went through. Having a sick child in hospital for long periods of time is stressful enough without having to worry about the financial cost on top of everything else. Thank you from the bottom of our hearts and on behalf of every family that will benefit from your kindness!